Sometimes I wish I could broadcast a picture of my face and a few words of advice every day on the EVE login screen. Not because I have a big ego or want to increase my already-great fame; I could care less about that sort of thing. I just want to force-feed some helpful tips to the carebears of highsec. For starters, don't go AFK in an untanked ship. Especially without a license. Let's find out what happened to some people who didn't take this advice during the week of February 2nd @ 00:00 EVEtime through February 8th @ 23:59 EVEtime. 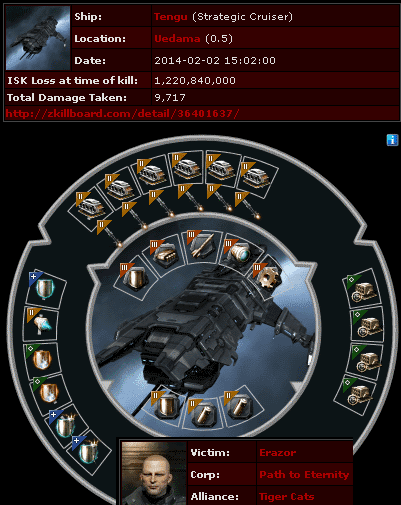 For some reason, Erazor spent 1.2 billion isk on a ship, just so he could fire some silly missiles in my highsec. Erazor went from eccentric to downright zany when he decided to go AFK in said ship while sitting in the Uedama system. That's like waving a flag in front of a bull. Agent D400 blapped him with a Tornado and that was that. 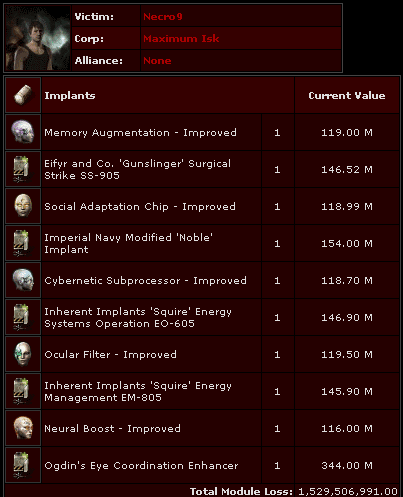 It's possible that the carebears are learning not to AFK autopilot with expensive implants: Necro9 lost the pod of the week, worth only 1.5 billion isk, to Agent D400. It could've been luck, though. I guess we'll find out next week if the Michi crowd is still out there. Transport is the theme of this week's Kills of the Week. DarkIgniter filled a cloaky hauler with nearly a billion isk worth of cargo--and didn't bother to use or even fit a cloak. Agents D400 and Ario Drumall saw his anti-tanked piñata and popped it without hesitation. Aderre also had a cloaky hauler, worth nearly 1.5 billion isk. He had the presence of mind to fit it with a cloak, and a microwarpdrive and an ECM burst, too. Here's the problem: You can't use any of those three things when you're AFK autopiloting. Fun fact about "Transport" class ships like the two Prorators featured this week: They're immune to cargo scanning. Why? Because highsec carebears wanted it. If a hauler gets caught in lowsec or nullsec, they're killed regardless of cargo. 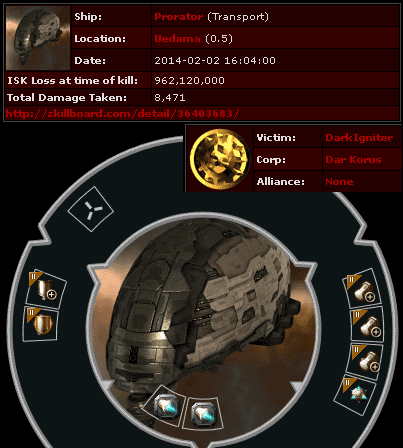 Only highsec gankers make a decision to attack or not based on the value of the cargo. But here's the thing: The Agents of the New Order don't care about what's in your cargo. They care about what's in your heart. Agents Quinn Barviainen and Ario Drumall saw that Aderre had the heart of a bot-aspirant, so they killed him. 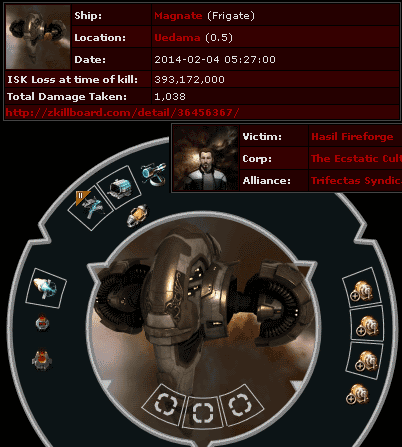 They popped his 1.4 billion isk pod, too, which almost made Pod of the Week. There's more than one cringe-worthy way to lose your cargo while autopiloting. Hasil Fireforge got a tech I frigate and slapped a bunch of warp core stabilizers on it, and filled it with nearly 400 million isk worth of cargo. I have nothing against warp core stabs, except it's hard to warp away when you're AFK. Agent Ario Drumall promptly sent this carebear to the abyss. Like I said, it was quite a week for the AFK haulers. 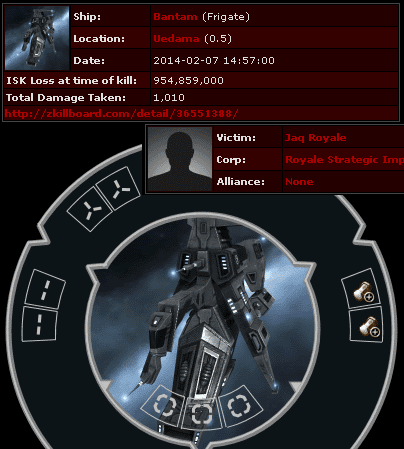 Jaq Royale took the cake when he filled his anti-tanked Bantam frigate with nearly a billion isk of cargo and sent it off to its doom. 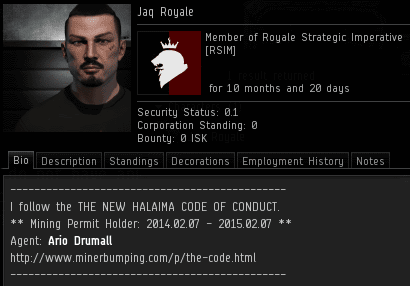 In case you haven't noticed, Ario Drumall has made quite a splash in his first month as an Agent of the New Order. He was responsible for this kill, as well. Underneath his bot-aspirant exterior, Jaq Royale proved to be a Gallant-aspirant. He immediately congratulated Ario on the gank. He already knew about the New Order and its Code, of course. He just needed a little one-on-one coaching from an Agent. Ario managed to kill and save the same person on the same day. Ario understood that Jaq Royale was worth saving. All the carebears are worth saving. Highsec is worth saving. That's what we're here to do. I do think he's hilarious. I also think he's right about the New Order controlling highsec. 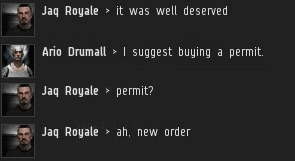 I see no difference between the New Order's claim to highsec and a nullsec alliance's claim to NPC null. Correct. In Eve, things happen because you make them happen. 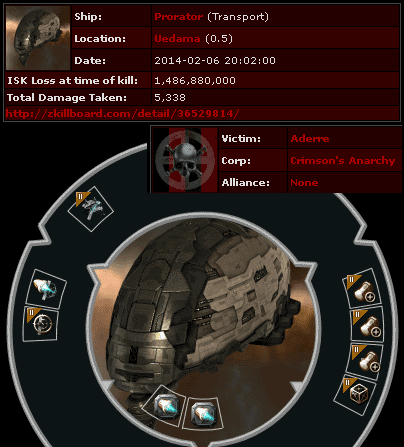 If you want to claim high sec, you need only undock and do it. What I find hilarious is that people don't see this blog for what it is- a tutorial for ANYONE to go start shaking down miners. They get wrapped up in the RP element but that's just to make it interesting. It's not required nor do you need to be a New Order person to simply go out and start drop kicking care bears. This is perhaps the most comprehensive tutorial ever written for Eve, emphasizing that anyone with a week old alt can extort miners. Wait until the rumor hits that we're all actually miners ourselves chasing off competition or something...then it'll be miner against miner as they turn on each other like hyenas. It's "couldn't care less" people, please use the expression correctly. Unless of course you really do care about the fame, in that case carry on. Clearly emphasising the writer's distance from the subject. It seems to be a purely North American expression, with no equivalent here in the UK that I'm aware of. If he's so delusional, Mr. Anonymous, then why not post with your main? Or are you too afraid that his army of delusions will descend upon you? It's interesting that you would take such offense to the creator of this blog calling highsec his own. Is this your first time here? And, you are aware that many other entities within this game claim to hold dominance over a particular system, or constellation, or region, or even celestials, gates, asteroid belts, etc; not including sov holding nullsec, but even NPC nullsec has it's corps/alliances that believe it's theirs. This isn't new and James isn't the only person who says they own an area of space, but James and the New Order are the only entity that decided to take highsec as a whole and are doing just that. Perhaps this realization offends you? pardon me good readers but Agent D400 has been getting away with flying a non-empty pod for quite some time, he needs to be taught that this is unacceptable behavior. Calling for a D400 podding campaign. You do know that most agents do not fly with empty pods, correct? Its wasted potential to do so. We don't go afk in space with implants however. The kill with the clothes is hilarious! I'm dying laughing!